In 106, the Roman general and statesman Gaius Marius was elected to his first consulate. This was the start of an era which he came to dominate - he held the consulship a record 7 times - and which would come to significantly influence Rome's transformation from Republic to Empire. Marius was responsible for enacting a series of important reforms of the Roman Army, and as a general he defeated the invading Teutones, Ambrones and Cimbri. In 91 BC Marcus Livius Drusus was elected Tribunis Plebis and revived the cause of the Gracchi brothers by proposing to extend Roman citizenship to all freemen of Italy. He was assassinated, and the Italian allies cities - the Socii - rebelled in what is known as the Social War. Obverse: Juno of Lanuvium, wearing goat's skin to right, I•S•M•R behind. Reverse: Bull charging to right, L THORIVS below, BALBVS in exergue, X above. Obverse: Bust of Hercules right, seen from behind; wearing lion skin; club over shoulder; shield in left field; I (control mark) in right field; P•E•S•C below. 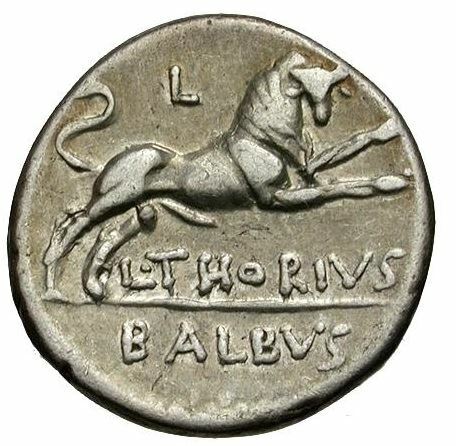 Reverse: Roma facing, holding spear, being crowned by Genius of the Roman People right; I (control mark) in left field, LENT•MAR•F in exergue; all within laurel-wreath. Obverse: Head of Mars left, wearing crested helmet ornamented with plume and annulet. Reverse: Two warriors fighting, each armed with sword in right hand and shield in left; the one on the left protects a fallen comrade; the other wears horned helmet; Q•THERM•MF in exergue.